We have been blessed, it must be said, with some recent fabulous 'pre-summer' weather. And I've enjoyed every minute of it. I simply wallowed in the beauty of our Easter break and there was a very special moment on the beach this week that will stay with me for a long time to come. Yes, I know it's early days and yes, I know that it's gotten cooler and we've had some more April-appropriate rainy weather of late. But it was sunny again today. Well, this morning at least and again later this evening. Tomorrow will bring an even lower drop in temperature and more rain, but today it warm warm enough to yet again enjoy a walk, and a brief lounge outdoors. In between the intermittent clouds and hailstones that is! 1. 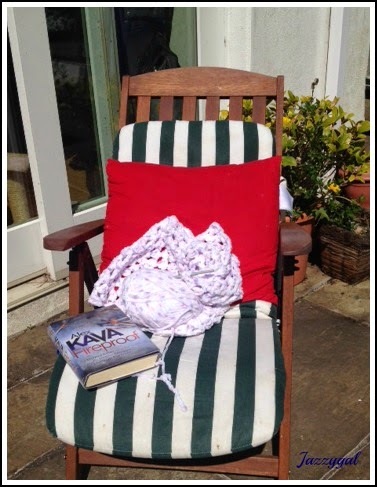 My solitary garden chair that gets unearthed from beneath it's rain and frost-worn protective covering, and it's faded cushion that's hastily rustled up from the depths of the spider-laden - *shudders* - garden shed, on every day that the sun deigns to shine. And I think that it's not long now until the protective covering is fully cast aside and the whole patio furniture set is revealed! 2. I look longingly at the barbecue resting underneath it's rain and frost-worn protective covering and think: 'it's not too soon to start using it, is it'? And then wonder, 'who's going to clean it first though?' But I already know the answer to that one! 3. The squeaking of the velux windows as they have their first opening of the approaching summer season, and I smile as both sides of big patio doors are finally cast wide open too. 4. The fully-laden clothes horse as it now regularly stands outside, with it's damp load gently flapping in the breeze. 5. 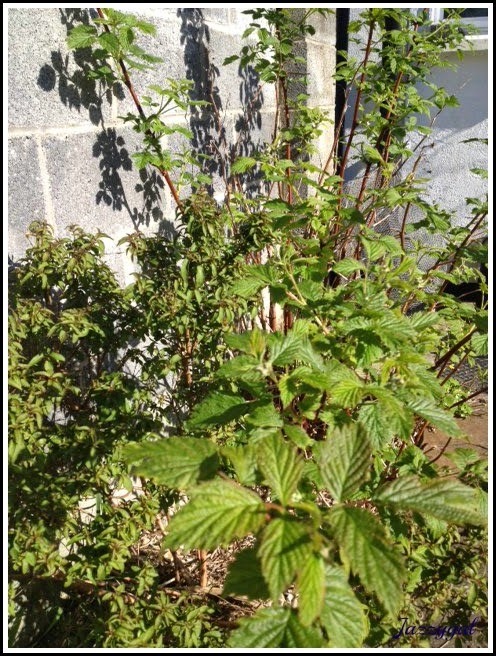 I start thinking of raspberry-based recipes as I admire our ever-expanding raspberry bush that is blooming, with it's flowers just waiting to pop open and burst into luscious, juicy fruit any time soon. 6. I end up wearing less coming home from a walk then I do going out, as I shed a layer en route. Rarely is a scarf or warm jacket needed these days but sunglasses are a must! 7. I think of the summer holiday that approaches and the even less layers I hope to be able to wear then, and promptly quicken my pace! 8. I notice the good moods and sunny dispositions of those I meet on walks or in shops these days, and their ever-growing smiles. 9. Ice cream. I haven't indulged yet but I will soon, and I just have to get my hands on one of those new Magnum ice creams! I think I'll start with the yummy strawberry white chocolate one , and see where I go from there. 10. As I laze on my lounger I think of sipping long, cold summer drinks, with maybe even the odd glass of wine in the back garden of an evening, as the sun begins it's decline. 11. The sun as it sets a little bit later each day and the harmonious twittering of the birdsong that trills insistently at that time, as if the birds also sense the approaching nightfall and don't want the sun to set either. 12. Sunscreen. Don't forget the sunscreen, no matter how early in the season it is! And so it appears that our lovely 'pre-summer' weather has departed for a while, but I'm sure it'll return. After all these are only my 'pre-summer' signs of summer. My real sign of the actual summer has yet to materialise you see. The annual invasion of the army of ants that descends, mistakenly considering our home to be theirs. Until we convince them otherwise, that is. So we can all relax, for until the ant invasion the arrival of our real summer has yet to come. Meanwhile I'll stock up on the sunscreen........ and the ant powder!! Love these. May I do a post of my signs of summer, and link to this one? Mine are very different although yours remind me of growing up in England with the washing on the line, the raspberries growing at the end of the garden, getting the deckchairs out. For me a big sign then was smelling the freshly cut grass in the school field behind our house. @Midlife Singlemum: Oh, yes please! I'd love to hear your Israeli signs of summer. Freshly cut grass.... yes, definitely a good one. I forgot that, although our grass has only been cut once in this pre-summer season! @BavarianSojourn: We're definitely being teased here too.... but not with temperatures as high as 27! It really is noticeable, this sunny cheeriness, isn't it? @Looking for Blue Sky: Any excuse, eh?!! I have first signs of Summer envy! Our weather hasn't quite decided to be spring yet..rather, it feels as if we went from winter to fall...although I do have some hope...even though it is in the upper 40's(Fahrenheit) I saw a few people wearing shorts...it was as if they were telling winter to stuff it..they would be greeting spring and summer regardless of the weather! @kathleen: Well, our weather has gone right back to winter now! Bloody freezing it is today! We always have to have hope though.... the summer WILL come. Soon. Hopefully!